Rediff.com » News » Will Azhagiri queer the pitch for DMK ahead of bypolls? Will Azhagiri queer the pitch for DMK ahead of bypolls? Calculated or otherwise, if Azhagiri’s firing of the first salvo after Karunanidhi’s death does not create some space for him to politico-electorally exploit at a later date, there may not be any space left for him at all, says N Sathiya Moorthy. By sounding the bugle for succession days after Dravida Munnetra Kazhagam patriarch M Karunanidhi’s death, his ‘discarded’ politician son M K Azhagairi may have done more harm than good for himself and the party that his younger brother and party working president M K Stalin had taken full control even when their father was alive. Though DMK cadres had known that nonagenarian Karunandhi was already living on borrowed time, the shock of his death is yet to sink in. Barring the formal anointment of Stalin as party president, which post he would not accept when Karunanidhi was still alive as a matter of respect and sentiment, the course is complete for him to take over. The emergency executive council of the party, meeting at Stalin’s instance in Chennai on Tuesday, is expected to pass a resolution in honour of Karunanidhi, and possibly on the issues that arose around the choice of a Marina funeral, rather than take up any serious issue. 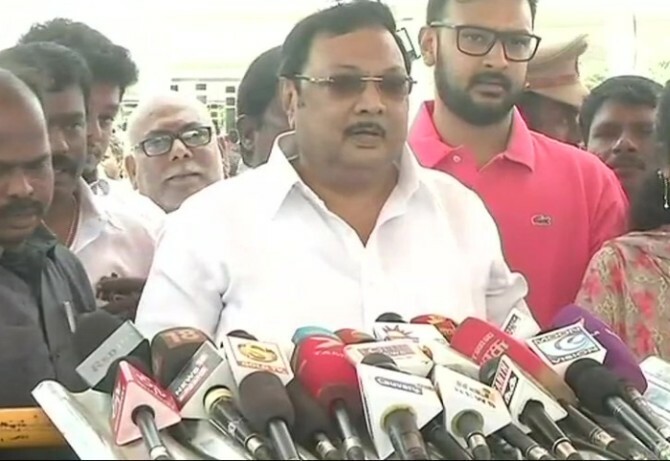 At least that was the indication until Azhagiri answered newsmen’s queries at Karunanidhi’s burial site in Marina on Monday, and said that ‘true loyalists’ of his father were still with him. However, he was not a member of the party, he added, and hence could not comment on the executive committee meeting called for Tuesday. More than the immediate, Azhagiri’s posturing may have greater relevance for the DMK in the two upcoming assembly by-elections, including one for Karunanidhi’s native Tiruvarur seat -- and afterwards. As coincidence would have it, the other vacancy, for the pilgrim-centre of Thirupparankundram, also falls in southern Tamil Nadu. This will be the first round of elections in the state after the death of two Dravidian icons, the ruling AIADMK’s chief minister Jayalalithaa (December 5, 2016) and parent DMK’s nonagenarian supremo Karunanidhi (August 7, 2018). The last time bypolls were held, AIADMK ‘rebel’ candidate T T V Dhinakaran, controversial nephew of Jayalalithaa’s imprisoned live-in confidante, V K Sasikala Natarajan, won Jaya’s R K Nagar seat by a huge margin as an ‘Independent’. Unless the Election Commission in its considered wisdom decides to hold the by-elections to the two seats along with the Lok Sabha polls due by May next, they would have to be conducted within the mandated six-month period, that is, by January next. Alternatively, if the Union Cabinet decides to have the Lok Sabha dissolved early on, in the light of favourable monsoon rains across much of the country, the parliamentary polls too may get advanced -- and with that the twin assembly by-polls in Tamil Nadu. Karunanidhi’s native Tirukuvalai village falls within Tiruvarur constituency, which again is a pilgrim centre. Contesting and winning the seat in elections 2011 for the first time after Tiruvarur became a ‘general’ seat from being a ‘reserved’ seat, five years later, in 2016, Karunanidhi recorded the highest victory margin of 68,000 votes for any assembly polls in the state, in his final electoral outing. The Thiruparankundram assembly seat fell vacant following the death of ruling AIADMK member, A K Bose, only days ahead of Karunanidhi. In a way, it may be seen as a ‘jinxed’ constituency by hopefuls as Bose is the second MLA, that too from the ruling party, to have died since the 2016 polls. Before Bose, who was denied the party ticket after being a legislator from another Madurai district constituency since 2011, S M Seenivelu was elected the AIADMK member in 2016. He died after his election but before being sworn in MLA. Thiruparankundram became one of the three assembly constituencies where by-elections were held when Jayalalithaa was in hospital. The party won all three seats, including the Thanjavur and Aravakurichi seats, where the EC had countermanded polling owing to ‘corrupt electoral practices’ by the main contestants, namely, the ruling AIADMK and the rival DMK. It is another matter that the Madras high court is seized of a DMK-initiated case pertaining to the genuineness of Jayalalithaa’s signature in all three candidates’ Form-B submission, requesting the EC to allot the party’s reserved ‘Two Leaves’ symbols to the candidates concerned. The by-elections are looming amid speculation that with the death of the two iconic Dravidian political figures, the state may witness a change of political tack and electoral fortunes for other players, already in the electoral arena and otherwise. In the first category is the ruling BJP at the Centre, and the rest, though it is the BJP which alone is considered to have some hope of collecting some votes in either or both constituencies. Ahead of the LS polls, the by-elections may give the main players an opportunity to mould their alliances, in full or partially. Already, parties like the MDMK and VCK are likely to join hands with the DMK combine, apart from the existing Congress and some Muslim allies. In 2014 and 2016, the MDMK and VCK were first with the BJP-NDA, and later floated another friend in the company of actor-politician Vijaykanth’s DMDK. A truncated BJP-NDA may continue with the same alliance and may even end up allotting one of the two seats to the Dalit-centred Puthiya Tamizhagam of Dr K Krishnaswami, former MLA and MP, with a purported base still in the southern districts. For the unmentioned Amma Makkal Munnetra Kazhagam of Dhinakaran, it will be a litmus test, first to find allies to endorse him as leader and chief ministerial candidate whenever assembly polls become due. Alternatively, if unsuccessful at getting an ally worth the name, Dhinakaran may end up going it alone -- more out of compulsion than deliberate and deliberated choice like with Jayalalithaa in 2014 and 2016. While there is no threat per se to continued Dravidian political dominance of Tamil Nadu elections just now, the by-elections may become a battle for supremacy from within -- first among the three visible contenders and then within the DMK, for instance. With Dhinakaran winning the R K Nagar bypoll, the ruling AIADMK needs to put him in place electorally, if it has to be seen as being continuously relevant to state politics, first in the LS polls and then in the more crucial assembly polls that are due in 2021. The alternative would be for the cadres of one to walk into the other, leading to the near-dissipation of the ‘residue’ party. Worse may be in store for the DMK, where Stalin is set to take over the reins of the party formally way ahead of the bypolls. Though DMK under his stewardship did very well in elections 2016 with the highest-ever 98 seats for the losing combine in the 234-member assembly and the lowest-ever vote-share margin (41-40 per cent in favour of AIADMK), critics, especially in the media, have been holding it against Stalin. As it happens, both seats, especially Thiruparankundram, fall under the area of operation allotted to Azhagiri in elections 2009. Under his care, the DMK-led combine won all 10 Lok Sabha seats from the southern districts in a hotly-contested election, where the Sri Lankan war and end-game were expected to impact on the southern districts, especially. Against this, in elections 2001, the DMK as the ruling party had lost a dozen or so seats in the region when Azhagiri, expelled from the party, fielded ‘rebels’, whose four-digit vote-shares provided the victory margins for the AIADMK winners against the official DMK candidates. Post-polls, Karunanidhi re-inducted Azhagiri into the party, but did not give him enough clout and powers in the organisational structure, leaving the party to the near-exclusive care of Stalin, who had stood by him through thick and thin, through the previous decades. Azhagiri, whom a section of the party cadres especially adored for his courageous stewardship bordering on recklessness to some, however went into semi-retirement when the DMK was in the Opposition (2011-2016), thus losing much of the halo and cadre-level clout. Azhagiri also became one of the very few DMK men, if at all, to be sacked by the party twice over a short period of a few years. This time round, Karunanidhi would not yield to pressures from within family members for effecting a patch-up between his two politician-sons. Karunanidhi was believed to have been hurt by Azhagiri’s wanton prediction that the DMK was doomed for ever -- or words to that effect -- and any other uncharitable personal references. At Karunanidhi’s hospitalisation, death and funeral, Azhagiri held himself with dignity and restraint. There was no provocation from any side, either, though long-time critics of the DMK, especially from the non-political segment, were hoping and talking of an imminent showdown. After all this, murmurs have erupted from some second and third-line cadres from the Azhagiri camp, for the DMK to accommodate their leader after re-admitting him into the party. Azhagiri too has posted a Tamil film-song on his Facebook account, indicating a willingness to patch up with his brother, who is now in full control. Stalin could and for all practical purposes ignore such appeals and calls, as his camp-followers may be thoroughly upset, especially if Azhagiri’s re-induction were to re-introduce lower-level re-arrangements, which could act to their detriment. For Stalin, who has lately been careful to try and keep away his immediate family from direct political involvement, if only to live down his father’s image as promoting the family at the cost of the party, may find it embarrassing if the DMK under his stewardship were to return to the old ways. A lot however on this score may depend on how the party performs in the two by-elections, and how the cadre and the voter perceive the performance, especially if it were to end up as a bad show for the DMK, after the R K Nagar reversals. In the midst of all this are the emerging hopefuls in star-politicians, Kamal Hassan, who has launched his Makkal Neethi Maiyam earlier this year, and Rajnikanth, who has been making frequent noises without any real move on the ground. They may have already started on the wrong foot, Rajini by seeking to promote his political cause (despite possible denials) by over-playing a pro-Dalit imagery through his recent films, Kabali and Kaala. Kamal Haasan gave a Muslim twist to the tale in his Vishwaroopam-1 in 2013, where ‘religious cover’ served a purpose for his character as an operative of Research & Analysis Wing (R&AW), the nation’s external intelligence wing, in terrorist-infested Afghanistan. However, in the sequel Vishwaroopam-2, released over the weekend, the perceived over-exploitation of the character may prove counter-productive in politico-electoral terms. Rajinikanth is seen by a section of the voters as pro-Hindutva. Another section sees Kamal as wantonly anti-Hindutva, both off-screen. These limitations on their electoral appeal notwithstanding, the large chunk of ‘non-committed voters’, whose numbers at one time was expected to burgeon to the mid-’90s levels of 20-25 per cent, may feel uncomfortable and ‘cheated’ that the star-politicians too have nothing new and different to offer, other than the ‘religion and caste’ politics that they believe to despise. In the immediate context, however, any low voter-backing for Kamal’s candidates in the upcoming by-elections, could sound the death knell for the party even before it had begun its political career, seriously. Not contesting the bypolls or siding with one of the established players would have the same effect on cadre and voter-psyche. For Rajinikanth, who is yet to launch his political outfit, not being able to field a candidate could well ensure that there is no ‘political vacuum’ for him to fill, if and when he is ready. It is also in this overall context that Azhagiri’s firing of the first salvo after Karunanidhi’s death needs to be viewed. Calculated or otherwise, if he does not create some space for him to politico-electorally exploit at a later date, there may not be any space left for him at all. In comparison, the internal strife still within the breakaway AIADMK rival may leave either of the two sides bruised to a greater or lesser extent, but not totally out of the game.